A historic plane has been restored for use as a tourist attraction at the gateway to Bahia Feliz and San Agustín in south Gran Canaria. 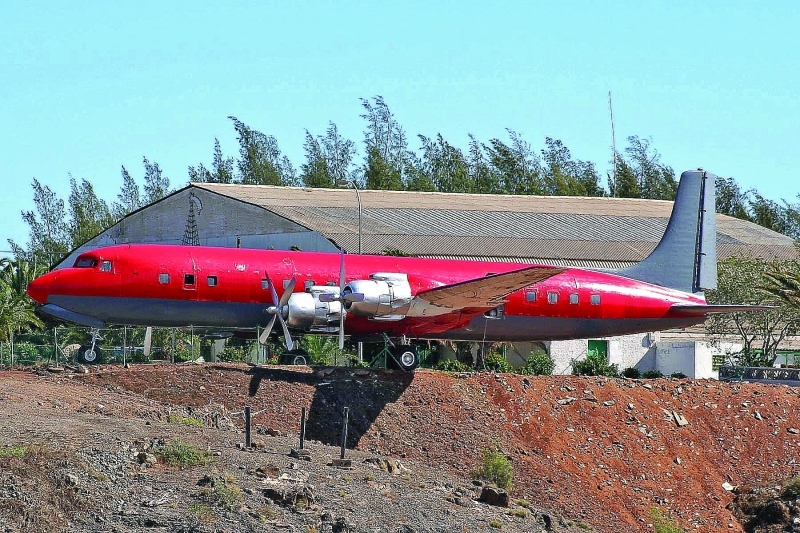 11.08.2015 - The Douglas DC7, used by airline Spantax for the first ever charter flights to the Canaries from Madrid and considered a landmark in the region’s tourism industry, now bears new colours having been painstakingly rebuilt and restored by Binter, the Canarian company that flies between the islands and to several destinations in Africa. Over one thousand hours went into removing rust and repairing the fuselage of the old plane, which was donated by Spantax to a local flying club and stood on the site for years in a state of neglect. Prior to its use as a charter plane, the DC7 had a chequered past, having been used initially for nonstop transatlantic flights by Swissair in the late 1950s before being sold to Scandinavian Airlines and then Japan Airlines. Now gleaming new in green and white, the restored DC7 was unveiled recently by Binter boss Pedro del Castillo, Gran Canaria’s tourism supremo Inés Jiménez and senior figures at the El Berriel Flying Club, and is already attracting attention from passing tourists. Produced with news.CMS in 0,0674 seconds.